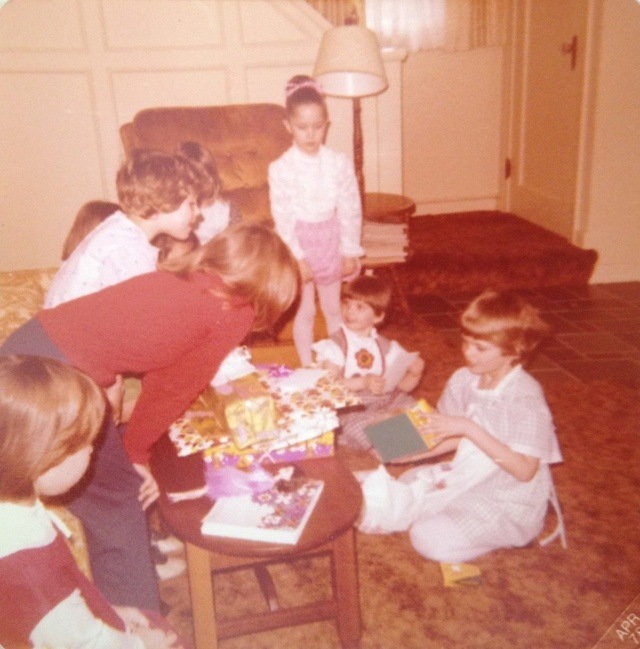 It’s my birthday today, and as such, probably not a bad time to be introspective – reflect on the past year, look ahead to the next, set some goals… Or, I could just post cute pictures of my birthday party from when I was a kid. Yeah, that sounds more like it. 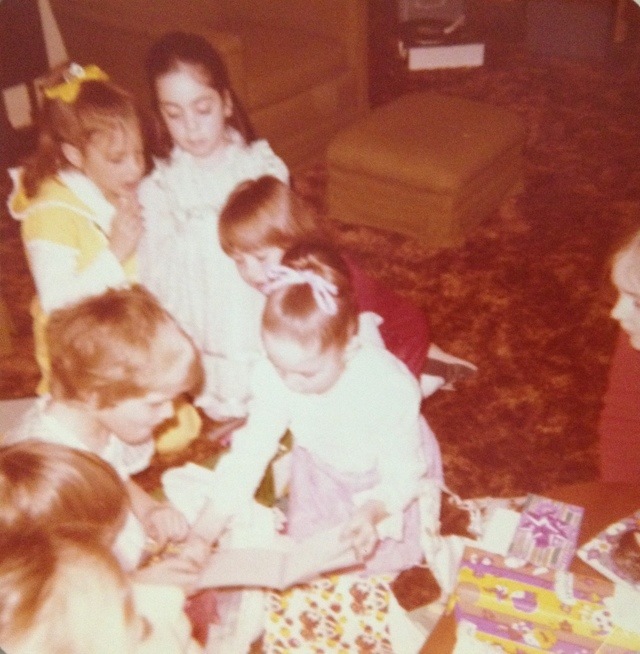 I don’t have a lot of photos of my kid-birthdays – I think most of them are still at my mom’s house. 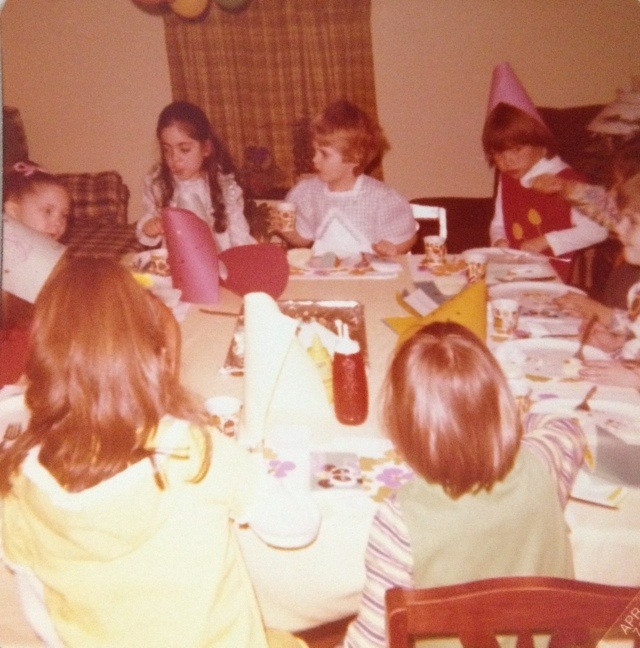 For some reason, though, I have about a half-dozen photos from my seventh birthday, which I am sure is what they are, because the photo printer helpfully tagged them “Apr 78” in the bottom corner. Heather shows me the details of her gift. I don’t remember anything about this party at all. I don’t even remember the names of everyone in the pictures, though I can identify – and am still in touch with, thanks to the wonders on Facebook – a couple of them. In fact, one of them, Heather, mentioned that she has a really specific memory of losing a game at one of my birthday parties. I suspect this might be the party she recalls, so I thought I’d share the pictures here. I don’t know why I am wearing what looks like a Holly Hobby dress, but I am sure I thought it was the cutest thing on earth at the time. And that’s all I’ve got for my birthday this year. Maybe I’ll be introspective later in the week. But probably not. Previous Article Sunday Snapshot: What’s Cuter than an Easter Bonnet?